A HS2 station is not now being recommended to be built at Meadowhall, instead the Sheffield city region could end up with three stations that can link to the £55.7 billion scheme. 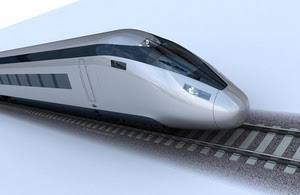 Construction on HS2, the high speed North to South rail link that aims to provide extra capacity to handle increasing demand, will begin during this Parliament and has been given a funding envelope of £55.7 billion in 2015 prices. It should reach Birmingham in 2026 and Manchester and Leeds by 2033. The new option proposes that HS2 services between London and Sheffield would take a spur off the new north-south high speed line and travel directly to the existing Sheffield Midland station using the existing railway line. These trains therefore could potentially also call at Chesterfield. There is also the future option of HS2 services extending onwards to the existing Meadowhall station, Rotherham, or Barnsley and a study is now expected to look at the potential for a parkway station on the M18/Eastern leg of the HS2 route which could serve the South Yorkshire area as a whole. A city centre station solution for Sheffield high speed services would allow the main HS2 line to be built east of the previously proposed route, following the M1 and M18 through Rotherham, and through less densely populated areas that would avoid the complexities of building a line via Meadowhall. The areas of Rotherham expected to be affected by the new route are discussed here. The newly proposed route would cut journey times on services heading to Leeds, York and Newcastle, and would also reduce the cost of the project by around £1billion. David Higgins, chairman of HS2 Ltd, said: "Projects of HS2's size, scale and significance should seek to provide the maximum benefit for the people they serve. "I have listened to the very constructive comments and discussions that have taken place on how HS2 should best serve South Yorkshire and recommend the option of HS2 services using the existing city centre station. "Decisions of this scale sometimes involve compromise, and through dialogue I believe we have reached the best solution for South Yorkshire. Sir Nigel Knowles, Chair of the Sheffield City Region LEP, added: "HS2 is a vital investment in the Sheffield City Region's future. I am delighted that we have had the time to work constructively to ensure the city region could be best served by Britain's new high speed rail network, which we expect to include trains calling at Chesterfield in the south of the city region, a parkway station as well as the line into the centre of Sheffield. "Connectivity with the rest of the UK is a major factor in achieving our growth plans. Of equal importance is the inter-connectivity within the North, via HS3, and we look forward to working with the government and other partners to bring that into fruition as quickly as possible. "So I welcome David Higgins' report and look forward to the Secretary of State's decision in due course." A number of alternative options were examined as Sheffield Council pushed for the South Yorkshire station to be located closer to the city centre. The prospect of HS3 - a TransNorth high speed rail link connecting the North's great cities - also meant that it would be illogical for HS2 going to an out of town parkway station whilst the Northern Powerhouse Rail project goes to the city centre. The options discounted include a costly plan to take the HS2 line through Sheffield Midland station and a HS2 loop through the unused Victoria station that was backed by Sheffield Council but discounted due to time penalties, costs and a lack of existing transport links. The new spur would see two trains per hour into Sheffield on existing lines whilst the main HS2 line continues to carry trains serving Leeds and further North. With a station at Meadowhall, indicative service patterns showed six trains per hour in each direction stopping in South Yorkshire. A total of ten trains per hour are expected to serve the eastern network in each direction. The "classic compatible" trains could also stop at Chesterfield. Compared to the fastest existing service of 120 minutes, this would result in a fastest London to Sheffield service of around 83 minutes for those trains which stop at Chesterfield and of 79 minutes for those that do not. The route would also be around £1 billion less expensive even when the links to the existing line and the necessary upgrades have been paid for. 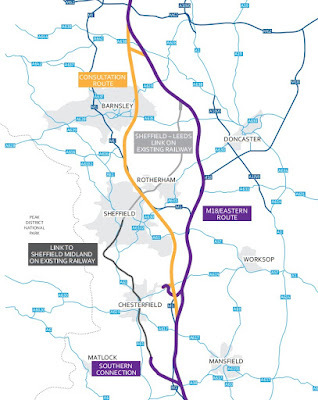 A loop heading north from Sheffield Midland and joining the HS2 line to Leeds is not promised in today's announcement but may be included in proposals for HS3 / Northern Powerhouse Rail which aims to link Sheffield with Leeds and Manchester in under 30 minutes. Andrew Denniff, chief executive at Barnsley & Rotherham Chamber of Commerce, said: "We have been consistent from Day One in supporting the HS2 option for Meadowhall as we felt that was the best option for the whole city region. The new proposal from HS2 appears to offer a solution that gives something to everyone and still manages to provide a link into the main route for Sheffield city centre. I am sure this will meet with widespread approval, it’s just a shame this could not have been tabled some years ago and we could have been much further advanced with the project and indeed saved a lot of time and expense." The Secretary of State for Transport will now consider David Higgins’ report in detail and make an announcement on the full HS2 Phase 2 route later this year. So let's just get this right - the original route ran between Rotherham and Sheffield, and through Barnsley, thereby giving immediate access to three main conurbations via the established and frequent public transport infrastructure within those areas. Whereas the new route circumnavigates all of the towns in South Yorkshire and by implication, connects to a very limited number of public transport routes. HS2 - serving only those who can afford it and stuff the riff-raff of South Yorkshire!! The way I see it is -the people of Sheffield will get the biggest benefit from this, meanwhile people whose houses are on the new route will have their houses blighted , and the rest of S Yorks willl have to extra journey time to get to Sheffield . The parkway station idea is probably just a softener & in due coarse will get scrapped anyway ! So is this a preview of how Devolution will work in the region? The largest voice stamps its feet until it gets what it wants at the expense of all others. Reaction from local MP's demonstrate that we have a long way to go. Sheffield council spent £190k loobying HS2 to get this change. Brilliant job...not! This isn't HS2 for South Yorkshire, it should be called the HS2 to bypass the cities and towns of South Yorkshire. There is still time to scrap this public sector 'indulgence'.lets look at the pros and cons. A great time saver.....about the time it takes to queue for a coffee at Costa. The woolly ,make it up as we go along route planning. The usual incapacity of the Public Sector to formulate or keep to a budget even before route alterations. The trains to be bought abroad. The majority of steel will need to be bought abroad . There is no guarantee that any part of the project can be kept in Britain. The only people able to 'afford' the fares will be hooray Henry, public sector (I'm not paying) management and lottery prize winners. The system will take a generation to bring to fruition and will in all likelihood be obsolete not long afterwards. This scheme is the ultimate waste of money which, as most people have said, could be better spent in almost any other way.